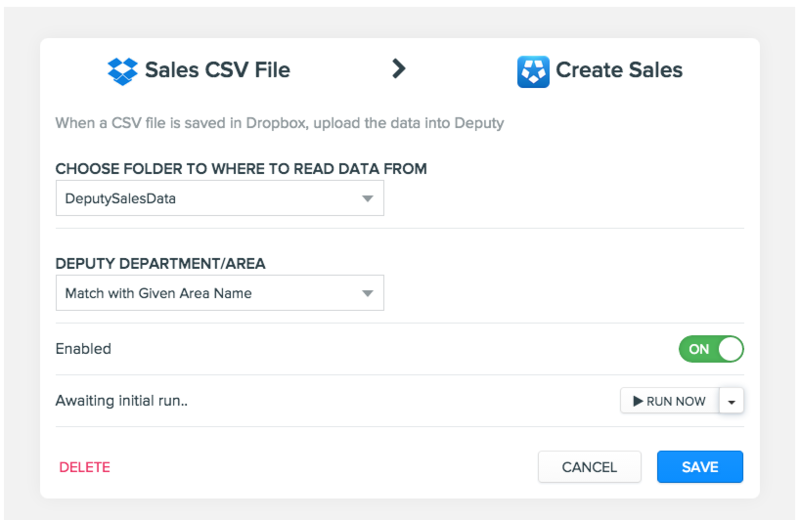 You can upload your sales data from your point of sales system via Dropbox through a CSV upload. Before you get started, you'll need to have a Dropbox account. If you don't have one already you can sign up here. If you're using the photo upload you'll also need to be using the Deputy Kiosk on your iPad. To access the integration, please first log into your Deputy account and visit your Home page. Please click "Settings" on the left side of your screen, next to the location in which you wish to create the integration. Next, please click "Add-ons" at the bottom of the list of options to the left then click "Select Services". 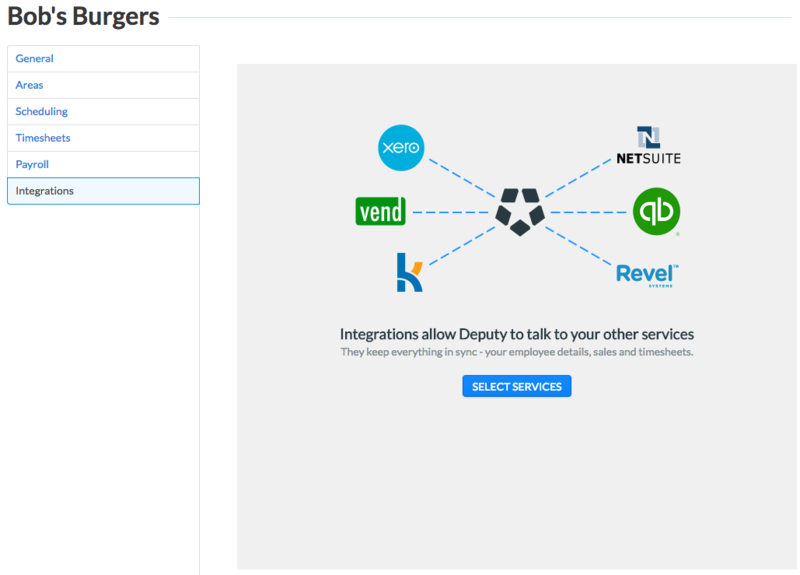 NOTE: If you do not see the screen below you already have existing integrations. 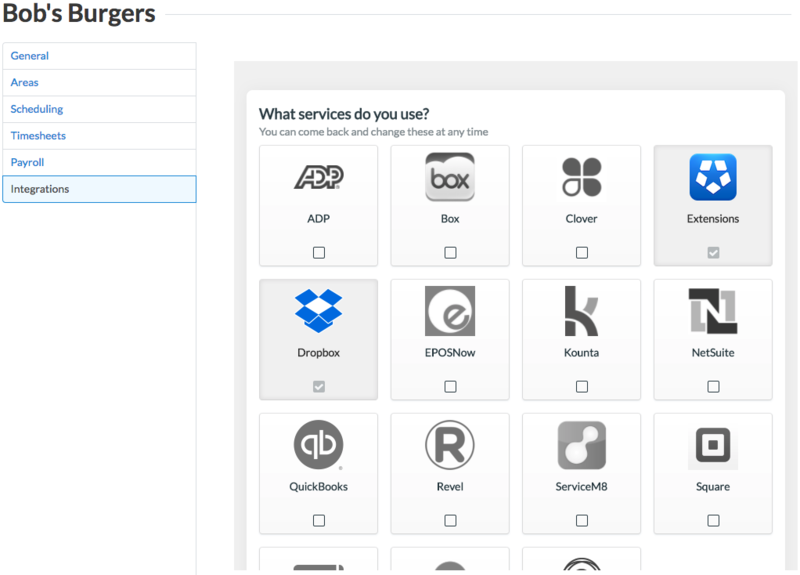 After clicking "Add-ons" you'll see the list of your integrations. Just above the list and to the right you will see a button reading "Edit Services". Please click that then follow the steps below. Here please tick the box below Dropbox then click "Continue". From here, please click "Authorize" to the right of the integration you'd like to set up. If you have already authorised you'll see "Activate" instead. The system will open a pop up window (please make sure you have pop-ups enabled) requesting your login details for Dropbox. Please enter them and allow access. On the following screen you'll be asked which folder you'd like to pull data from in Dropbox. The folders will be created after you save the integration. For the Photo Upload please select "DeputyPhotos" and for the Sales Upload please select "DeputySalesData". When setting up the Sales integration please use the lower selector to select which department you'd like the sales applied to. If you want the sales to correspond with the area you designate within the CSV, please select "Match with Given Area Name". Next, please click "Save" at the bottom of the screen. Doing so will create an "Apps" folder in Dropbox. Within that folder, you'll be able to find the subfolders for your sales and photos. In the DeputySalesData you will see a file named "mapping.txt". Please do not delete this file as it allows the system to correctly read your CSV file. Now that the subfolder has been created you'll need to run the integration once, after which it will continue to run. If you have not already created a CSV according to the steps on step 2 please do so now. The headers in the CSV would comprise of Date/Time, Sales Transaction, Operator ID, and Monetary Value. For help with this step, please contact Dropbox Support. To run the integration please click "Edit" next to the integration you just created, then click "Run Now". If you click the down arrow next to "Run Now" you'll be able to run it for the last hour, day, week, or month. When setting up the Photo integration please use the selector to choose which folder you'd like to upload the photos to. Please select "DeputyPhotos". Next, please click "Save" at the bottom of the screen. Doing so will create an "Apps" folder in Dropbox. Within that folder you'll be able to find the subfolders for your photos (and sales). The DeputyPhotos folder will contain any photos you upload from now on. You will now be redirected back to the list of integrations. The final step is to run the integration, which will upload the photos. You'll only need to do this once, as afterwards it will continue to run. To do so, please click "Edit" next to the integration you just created. On the next page you'll see the option for "Run Now". You may also click the down arrow to select whether or not you'd like to run (upload) the photos from the last hour, day, week, or month. After you have done so, please click "Save". 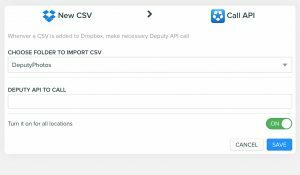 We have added a new Dropbox integration, allowing you to create a CSV file calling up any field entered in the Deputy API. 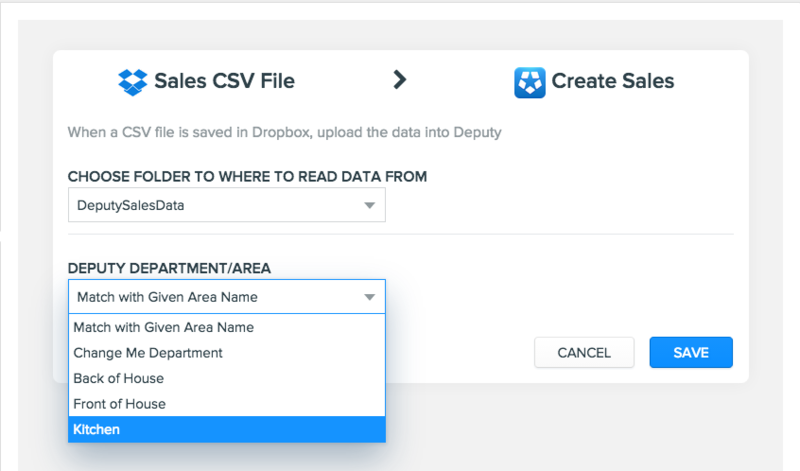 Previously we have had this option for sales data and photos, which is explained above, but we have now developed a way to create a .CSV file that can be populated by any piece of data that is entered into Deputy. This can include sales data, or even employee birthdays, work locations or employee contact details. To do this, you will need to enable integrations with Dropbox. 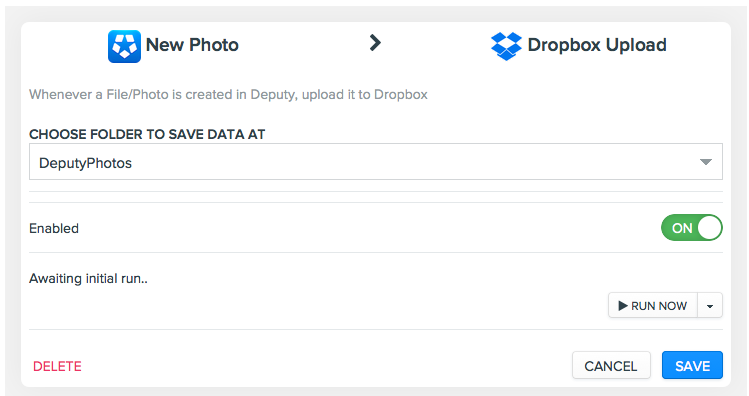 To enable this, you must connect your Deputy account to your Dropbox account. To do this, simply follow the instructions above. You can then create a custom Dropbox folder to make it easier to navigate. Just open up your Dropbox account, then to to Apps > Deputy, then create your folder in here. You can select your custom folder in the drop down box, which will be where the .CSV files will be stored. Click save when you are complete. Note: We suggest switching ‘Turn it on for all locations’ off, as it may cause errors.